Sometimes they have lines in them, or grid squares, but even when the insides are completely blank, they all have one thing in common: they have been presented to me with the expectation that I will fill them. But even if we don’t make it to a live performance, I’m looking forward to having a few dates with my Nutcracker Prince over the weeks between now and Christmas. He’ll bring the great music and muscular thighs, and I’ll bring coffee, Danish butter cookies, and my appreciation of the arts. But daily blogging, in many ways, was my version of skating school figures. They’re not particularly pretty to the uninformed, but they teach discipline, help you hone technique, give you stamina…and sometimes you do something when practicing a basic figure that informs or inspires a larger piece – leads you to your long program. 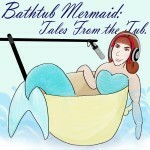 Music for The Bathtub Mermaid is provided by Mevio’s Music Alley, a great resource for podsafe music. The opening song is “Soap in a Bathtub,” by Stoney. The closing song is “You Can Use My Bathtub, by Little Thom.